Reaching 2128m at its highest point, Mount Pilatus looms high over the city of Lucerne. Reaching 2128m at its highest point, Mount Pilatus looms high over the city of Lucerne. Wandering the riverbank you just can’t miss it. I would put it up there in the top 3 mountain excursions in Switzerland, and undoubtedly the best day trip from Lucerne. Steeped in folklore it’s said that in medieval times a dragon lived on the mountain. So if you want to go dragon hunting, what’s the best way to make it to the top? The ‘Golden Round Trip’ ticket provides you with a fantastic array of transport to get up and down the mountain, including a boat, cogwheel railway, multiple cable-cars and last and most definitely least – a bus. The trip takes you around one side of the mountain for the ascent and back down the other for the descent, all with the fantastic efficiency you’d expect from Switzerland. 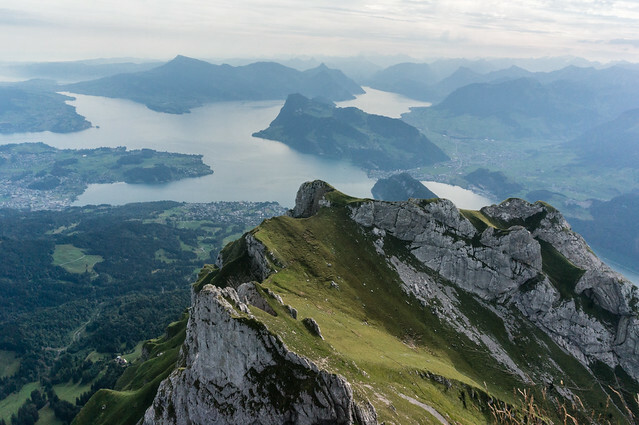 Lake Lucerne, a photo by Flights. Camera. Satisfaction. on Flickr. The most popular direction for the journey starts at the harbour in Lucerne, with a boat destined for Alpnachstad. 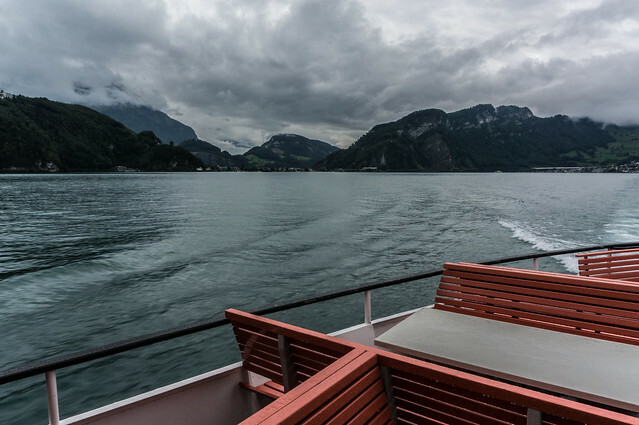 The 50 minute ride across the beautiful Lake Lucerne is a fantastic trip by itself. The landscape around the lake is quite unique, with rolling hills and haphazard mountains in every direction. On disembarking the boat at Alpnachstad, the world’s steepest cogwheel railway awaits to take you slowly to the summit. The train climbs the mountain at what may seem like impossible angles, but I can confirm that the 40 minute journey does indeed get you to the summit in one piece. This train operates only between May and November before the snow starts to fall and sets in for winter. Summit, Mount Pilatus, a photo by Flights. Camera. Satisfaction. on Flickr. 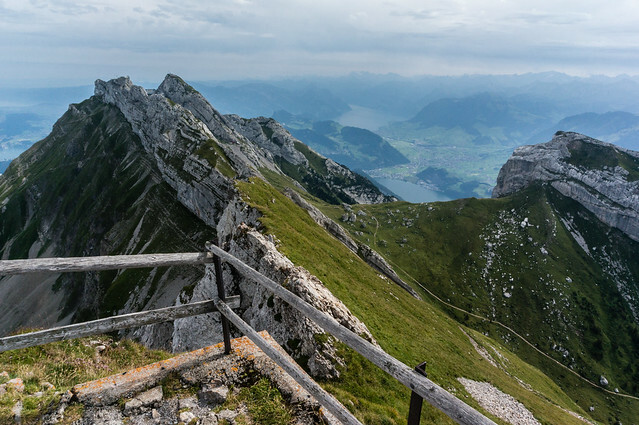 Once you’ve made it to the top of Pilatus, there are a number of peaks you can climb to for some spectacular views. The two closest to the railway station are named Esel and Oberhaupt. There are man made steps fashioned from the rocks to reach both summits, with no difficult terrain to speak of. 5-10 minutes should be enough to make it to either peak. The third peak you can walk to from the starting point is the Tomlishorn. This is a longer walk requiring about 30-40 minutes in each direction. The majority of the walk is paved and fairly flat, but the final few hundred metres are quite steep on uneven rocky terrain. It’s more than worth it though. This peak is much smaller in footprint than the Esel or Oberhaupt, with far fewer people. The views are outstanding and its peaceful nature make it my favourite peak of the three. It would make a great place to stop and enjoy a picnic. Tomlishorn, Mount Pilatus, a photo by Flights. Camera. Satisfaction. on Flickr. If the walking makes you hungry or you happen to be visiting over lunch time there are two restaurants at the top of Pilatus. I would recommend making a day of the trip. Try and get to the summit early when the weather is most likely to be best, spend a morning exploring the three peaks and then stop for lunch. 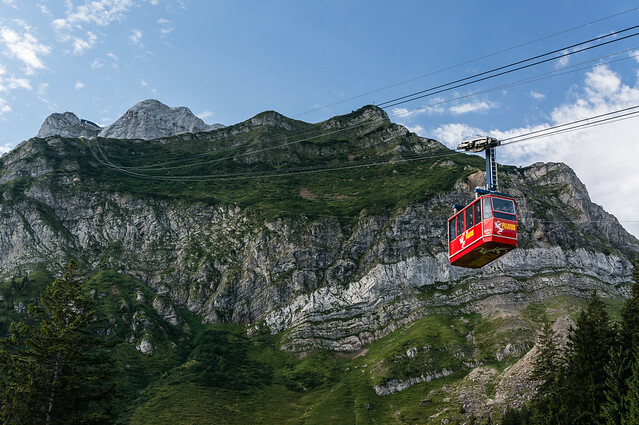 Cable-Car, Mount Pilatus, a photo by Flights. Camera. Satisfaction. on Flickr. Once you’ve had enough of the summit, your descent will start at the cable-car station. There are two cable-cars involved in traversing this side of the mountain. The first will take you to Fräkmüntegg where those seeking a bit of excitement can stop for a ride on the longest summer toboggan run in Switzerland. This cable-car runs every 15 minutes. From Fräkmüntegg you’ll need to take the gondola back to the town of Kriens. These are very frequent, running much like a normal gondola system at any mountain resort. 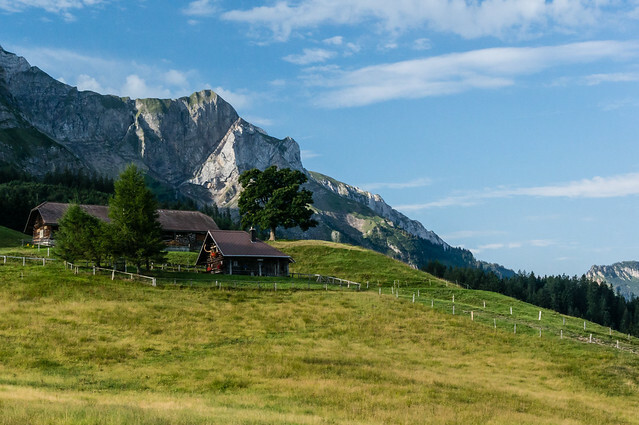 House, Mount Pilatus, a photo by Flights. Camera. Satisfaction. on Flickr. Upon reaching Kriens you’ll have a 10 minute walk to the Pilatus bus stop. From here take the number 1 bus back toward Lucerne and the train station, where you can get a refreshing drink somewhere and think about the incredible experience that was Pilatus. Try taking the Golden Round Trip in the opposite direction to that I have outlined. Start with the bus and cable-cars, leaving the cogwheel railway and boat for your journey back to Lucerne. This will help you avoid the large number of tourists who tend to make the journey in the more traditional fashion. If you buy your Golden Round Trip ticket at the train station you should receive a 10CHF discount for food and drink at the summit. This is a welcome freebie in the most expensive part of Switzerland I’ve visited! For the very active (or cash-strapped) visitor there are a number of hiking trails you can take to ascend or descend the mountain. This will not only save you a big chunk of money, but also give you a unique experience on the mountain. I’ve not walked them myself, but if they’re anything like other routes in Switzerland they’ll be well signposted and a joy to behold. For more information you can visit the official Pilatus website. This should answer all of your questions, it’s the only resource I used when planning my trip!